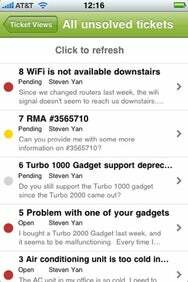 Zendesk, a Web-based customer support service for small, midsize, and large businesses, has updated its iPhone app with support for iOS 4, more Twitter integration, and easy access to ticket requester information. Zendesk for iPhone gives your staff mobile access to customer support tickets, allowing them to monitor or respond to tickets while on-the-go, whether customers contacted you through e-mail, Twitter, or your company’s Web form. This unassuming 1.0.2 update adds some key service integration, including better support for “twickets”—tickets created by customers through Twitter. Zendesk for iPhone will now visually mark twickets with a Twitter badge and allow you to respond either via public reply or a direct message. Zendesk 1.0.2 can now also display ticket requester information, including name, date, and their Twitter account. The new version also brings iOS 4 support, including multitasking, as well as high-resolution graphics for the iPhone 4. Zendesk for iPhone is free, as the company offers a variety of pricing models for its range of customers that includes MSNBC, Lonely Planet, and Twitter. Monthly pricing starts at $9 per seat for up to three seats at small businesses, then moves to $29 per seat for up to 20 seats at “agile organizations,” and $59 per seat for up to 100 seats at large organizations. Interested customers with more than 100 seats should contact Zendesk directly for pricing.